9.14m x 4.57m x 1.32m (extra depth). Supplied with 0.50mm liner thickness. "Magnum Range" Oval Swimming Pool! Buttress Free Pools also available on request. Pia from Berkshire - Oval 550 x 366 x 120cms. Gary from Italy - 6.4m x 3.66m x 1.2m Oval Pool. Phil Harper - 5.5m above ground round pool put In-Ground. Mark - 4.6m Customer Pool Project, Radcliffe. 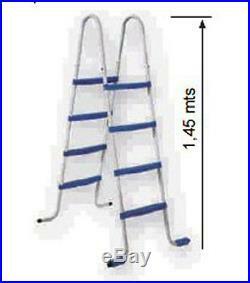 Take a look in our E-bay shop to see our other pool offer's. Other sizes available and are in our shop. (6.4m, 7.31m and 9.14m sizes are possible in this pool). To avoid disappointment Please allow at most. Up to 4 weeks to deliver. We do not deliver to the Channel Islands, Isles of Scilly, Isle of Man, Western Isles, Hebrides, Orkney and Shetland. What is included in this Pool Kit. 9.14m x 4.57m x 1.32m Pool. Sand pump/filter (Minimum 8 m3/h). Should customer choose to do so, it is at the buyers own risk. Bearing in mind again, that an in-ground use is at the customers own risk. The item "Magnum above ground Swimming Pool Oval 9.1x4.5 x1.3m" is in sale since Thursday, January 27, 2011. This item is in the category "Garden & Patio\Swimming Pools & Hot Tubs\Other Swimming Pool & Hot Tub".